Samsung has launched the Galaxy Note 8.0 in India. 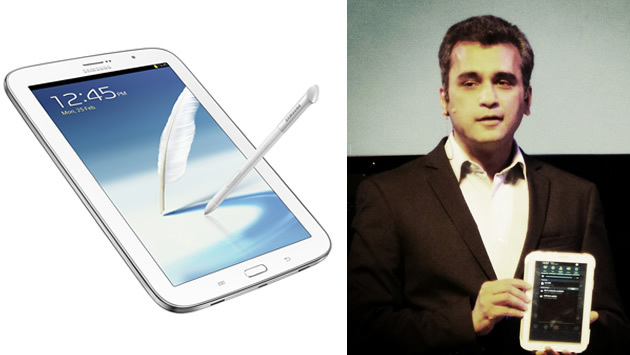 Just a few days ago, Galaxy Note 8.0 has been showcased by Samsung in MWC 2013. Samsung launched this product in India first prior to any other countries. Galaxy Note 8.0 will put their Arch rivals Apple iPad mini backwards. The Samsung Galaxy Note 8.0 has come with all features that offered by Galaxy series. The Note 8.0 will come with an 8.0 inch screen of resolution 1280×800 pixels and 189 pixels per inch. An Exynos 1.6GHz quad-core processor does the processing for you which is complemented by 2GB RAM. The Samsung Galaxy Note 8.0 offers a primary 5-megapixel camera without LED flash. You get a 1.3 megapixel front camera for video calling. This Tablet comes with the 4,600 mAH battery which will give it quite the battery life on a single charge. Like the iPad mini Note 8.0 will offer 16 GB and 32 GB models and will provide an option to expand the internal memory too via a microSD card which the iPad Mini lacks. Apple also not going only watch this Samsung move, they are also planning to launch the next iPad Mini 2 in future days. We are also waiting for the Apple’s move that what iPad Mini 2 will Feature ? and this product will give them upper hand in 8 inch tablet market. There is no official word from Samsung about the pricing of Galaxy Note 8.0. Reports suggested that Samsung will disclose it in mid-March and the Note 8.0 also will hit stores in same day.